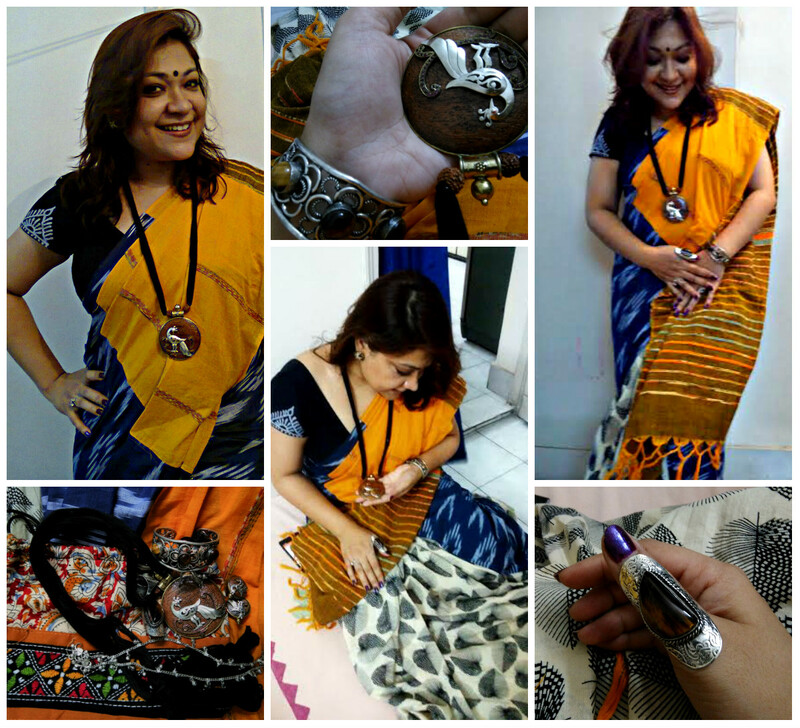 It has been tagged as a Bohemian piece by none other than its creator, designer Piya Sen. The exhibition hours were almost over, I was in an exit mode when this quiet corner zone caught my attraction. A single, smart young lady was officially hosting the stall giving a proxy for her designer friend. I simply loved her genuine and honest intention and eagerness to present her friend’s designs. Wonderful innovations with simple touches made it a genuine collection. The total package was too much! I had to go for this wonderful creation. When I asked Piya, what was her thought behind this piece, she simply reflected uncannily my mind and thus 58/100 moment is dedicated to you Piya, as well as all those ladies who feels ‘Saree’ is just not a nyaka (acting like a coy) or wedding attire. It is bold, bohemian, crazy, sensuous, elegant stuff that we are proud to present…. The saree reflects 3 different colours and patterns in a sober way. The pallu is cotton hand-loom khesh, blue part is cotton ikkat and the rest is butter cotton malmal…. In fact there a bit of strange similarity between 58/100 ‘ Boho’ and 57/100 ‘Fusion’ saree too, but that reflects how I love my unconventional art mind !! 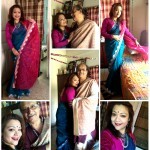 58/100 saree moment was attending a family get-together, on the occasion Bijaya Dashami .